King Duncan I of Scotland or Ddonnchad mac Crinian was born on 5th August, 1001, the son of Bethoc, the daughter of Malcolm II MacAlpin and Crinan, hereditary lay Abbot of Dunkeld. He is reported to have allied himself in marriage to Aelflaed of Northumbria, cousin of Siward Digera, Earl of Northumbria, although a variant of the Chronicle of the Kings of Alba, gives Duncan's wife the Gaelic name Suthen. There were many rival claimants to contest his claim to the Scottish throne, one of which one was murdered and the other died shortly after, a third, Lulach, being only an infant at the time , was not considered to be an immediate threat to the new regime. Duncan had at least two sons, the eldest, Malcolm (Máel Coluim mac Donnchada) reigned as king from 1058 to 1093, the second Donald (Domnall Bán, or "Donalbane") was king afterwards. 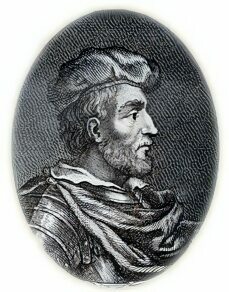 Máel Muire, Earl of Atholl is a possible third son of Duncan, although this remains uncertain. The reign of Duncan 'the Gracious' was destined to be a troubled and tumultuous one. The Earl of Bernica invaded Cumbria in 1038. Duncan proceeded south with a large army and laid siege to Durham, but met with disastrous defeat. A further threat to his rule was posed by Macbeth, Mormaer (Earl) of Moray, Malcolm's grandson by his other daughter, Donada. Shakespeare was later to immortalize both him and Duncan in his play of the same name. He was married to Gruoch, the widowed mother of Lulach. Macbeth did not, as reported by Shakespeare, murder the innocent Duncan in his sleep, but after leading an army north into Moray, Macbeth's domain, apparently on a punitive expedition against Moray, he was killed during or after a battle at Bothganowan, near Elgin, on 15th August, 1040. Duncan is is thought to have been first buried at Elgin before being re-interred at Iona Abbey, the traditional burial place of the Gaelic Kings of Scotland.